Historic Savannah Foundation’s preservation and education coordinator Danielle Meunier, right, congratulates Gadsden Elementary School student Pe’lae Massey, left, for creating the design selected as the official 2013 Savannah Preservation Festival poster. 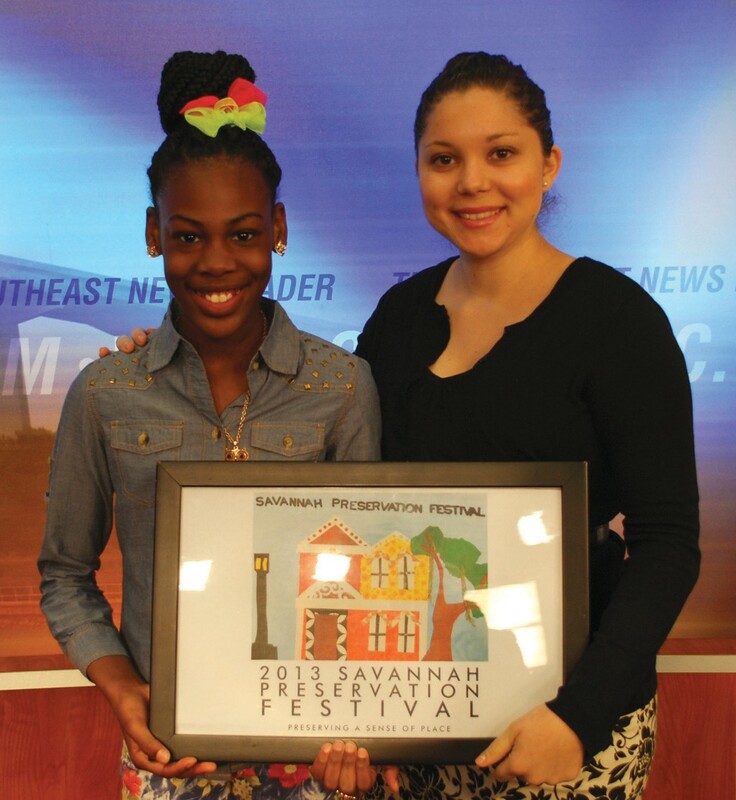 Historic Savannah Foundation (HSF), a leading preservation organization committed to preserving and protecting Savannah’s heritage, recently selected Gadsden Elementary School student Pe’lae Massey’s design as the official 2013 Savannah Preservation Festival poster. The 2013 Savannah Preservation Festival officially kicks off on May 2 and reinforces HSF’s ongoing mission of education and outreach. Savannah Preservation Festival ticket packages are currently available online at www.myHSF.org. HSF is currently accepting submissions for the 2013 Pennies for Preservation Poster Contest. Submission rules and applications are also available online at www.myHSF.org. Historic Savannah Foundation is a non-profit historic preservation organization supported by a strong and dedicated membership. HSF was established in 1955 in order to save the 1820 Isaiah Davenport House from demolition. From this initial project, Historic Savannah Foundation launched a Revolving Fund which has since saved 350+ buildings. The mission of Historic Savannah Foundation is to preserve and protect Savannah’s heritage through advocacy, education and community involvement. For more information, visit www.myHSF.org or www.DavenportHouseMuseum.org.